In December of 1998, I was 23 years old. I lived with my parents and worked at a non-profit in the DC area. I was dating a DC rock icon, and that was, to me, the most important part of my life. Together, my boyfriend and I drank a LOT. So I was never surprised to wake up feeling hungover. Until the day I felt hungover without having partied the night before. Half way through the day, something clicked. I looked at a calendar. I had missed my period. I took a pregnancy test that night and was not the least bit surprised to see that it was positive. When I called Brian to share the news, he simply said, “Let’s take care of it.” I WAS SO RELIEVED. I felt so lucky to have such a caring boyfriend who wouldn’t make me face this “choice” on my own. He reassured me, “Don’t worry, I’ve done this before.” PHEW. So lucky! When we arrived at the clinic, I checked in and Brian paid for the procedure with his band’s AMEX. That actually made me laugh. It was a little over seven hundred dollars, because I was lucky enough to be able to afford to be anesthetized for the procedure. So lucky. I remember very little about the procedure. I remember the abortionist introduced himself (though I didn’t feel like I was making the best first impression, there on the table in nothing but a surgical gown) and the nurse inserted my IV. He told me he had a daughter and actually started talking to me about mutual interests that she and I had. In retrospect, I am so disgusted. This father was making a living sucking the life out of women, and had the nerve to mention his own daughter to me. As he performed an ultrasound, he looked over my shoulder—the screen was behind me—and said, “Perfect! You’re just about eight or nine weeks.” Obviously I knew nothing about fetal development, but I felt so lucky that I was “just about eight or nine weeks.” And shortly thereafter, I fell asleep. When I awoke, I was being wheeled to the recovery room. I was helped into a recliner. Then I sat, in a room full of recliners, with girls who obviously couldn’t afford the anesthesia, who were all sobbing. I felt so lucky sitting in that room, thinking I must be the only one with such a wonderful boyfriend who would help me through this. When I had waited long enough, Brian picked me up. He had been at Home Depot to pass the time. Seriously. He was considering home improvements while a child of mine (maybe not his) was being killed. It really was no big deal. I was so lucky. After napping I was raring to get back out to the bar scene. There was not enough whiskey in DC to satisfy me that night, or any night for many months following. When I woke up the morning after my abortion, Brian asked how I slept. I said, “Like a baby.” He said, “You mean like a baby KILLER? !” So. Lucky. For months after that, I knew nothing except that I wanted to die. Death was the only certain escape from the horrific pit that had formed in my soul. I begged for therapy. I screamed for help. But only inside. How could I admit what I had done? So I buried it. No one else needed to know. No one else needed to judge me as harshly as I had come to judge myself. I trudged through several more years, feeling happy at times and doomed at others. One day I was running and listening to a homily by Fr. Larry Richards about Confession. 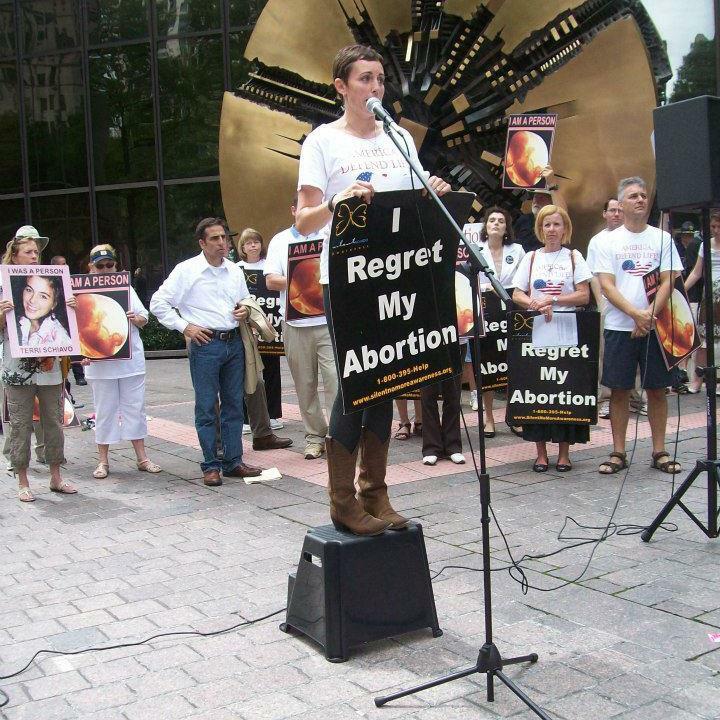 He said (loosely), “If you’ve had an abortion, confess it. Your child is praying for you in Heaven.” My chest heaved with uncontrollable sobs and I ran home to arrange an appointment for Confession with my dear Priest. There in the confessional, heaving with sobs once more, I truly expected to be struck by lightning. I now sat there acknowledging that I was guilty of the worst sin possible, murder. My dear Priest smiled and handed me a box of tissues and said, “God is so happy you are here. You will be forgiven, but you need healing.” He then proceeded to tell me about Rachel’s Vineyard, a ministry aimed towards healing from abortion. My recovery retreat was a sincerely life-changing experience and I thank God for it. I thank God for Father Roux, for Father Frank and Rachel’s Vineyard, for my loving husband Mike and our amazing four children, and for YOU. I thank God for the entire pro-LIFE movement. I wouldn’t wish my experience on the least of my enemies.